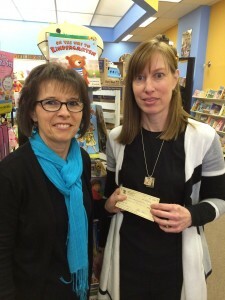 Carla Kettner, representative of the Seward Community Read to Me Program, is presented with a check from Lana Urban. Lana Urban, Seward Optimist Club President, presented Carla Kettner, representative of the Seward Community Read to Me Program a check for $500.00. The donation will provide a free book and parent information to all children attending kindergarten round up at all Seward schools. The Seward Community Read to Me Program is a collaborative effort to promote the value of reading aloud with young children. Their purpose is to assist families as they read with their children and encourage them to do so; to get books into the hands of children; to build excitement for reading; and to educate parents on the value of reading aloud with children of all ages. With donations from community organizations and individuals, the Read to Me Program provides a free book and parent information to children attending kindergarten round-up at all Seward schools, each infant born at Seward Memorial Hospital, fourth graders in Seward schools, and other groups of Seward-area children.